Construction zones can be irritating because of the delays and the mess. But they can also be very dangerous places and a catalyst for car accidents. Car accidents in construction zones are usually the result of an inattentive driver, a speeding driver or a poorly marked and managed construction zone. Inattentive Drivers – Drivers can be distracted by the scene itself such as watching workers set a large beam instead of focusing on the road. Or, they can easily be distracted by things inside their own vehicle such as their phone, their navigational device, putting on make-up, etc. If a driver is not paying close attention in a construction zone, they may not make a necessary lane shift or they may miss signage directing them to proceed a certain way. Speeding Drivers – Large trucks slowly entering the roadway from the construction site may surprise a speeding driver. Likewise, uneven road surfaces can cause a speeding driver to lose control. A speeding driver may not be able to react quickly enough to sharp lane shifts or stopped traffic. Poorly Marked Construction Zone – Construction companies have many tools at their disposal to help motorists safely navigate the construction zone. Flashing lights, barrels, signs, concrete barriers, etc. can be used to help make the site as safe as possible for motorists. But all too often, the signage is confusing or does not provide enough warning. Alternatively, the lane shifts are not clearly marked or the concrete barriers improperly reduce the size of the lane of travel. 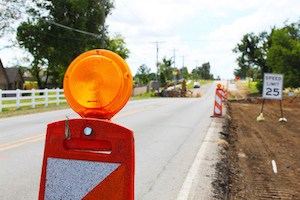 These are some of the most common reasons for construction zone accidents. But there are many others. And quite often, the accident is caused by a combination of factors and multiple parties may be at fault. So, it is critical to hire a lawyer with the experience to properly investigate the accident, the legal knowledge to know which parties are responsible for your injuries and the skill to secure you the best settlement reasonably possible. At The Law Offices of John Day, P.C. our award-winning attorneys are passionate about helping folks who have been injured or who have lost a loved one in a car accident. We offer a no-cost, no-obligation consultation so that we can review your case and decide if we can help you. So that you do not have to pay anything out of pocket to pursue your legal rights, we handle all accident cases on a contingency basis. If you would like to discuss your construction zone car accident, call us anytime at 615-742-4880 or toll-free at 866.812.8787 or simply fill out this online form and we will call you. How Much Does It Cost To Meet With You And Discuss My Case?